The geographic area of North and Central America served by the AUA has been divided into eight geographic regions known as a "Section." 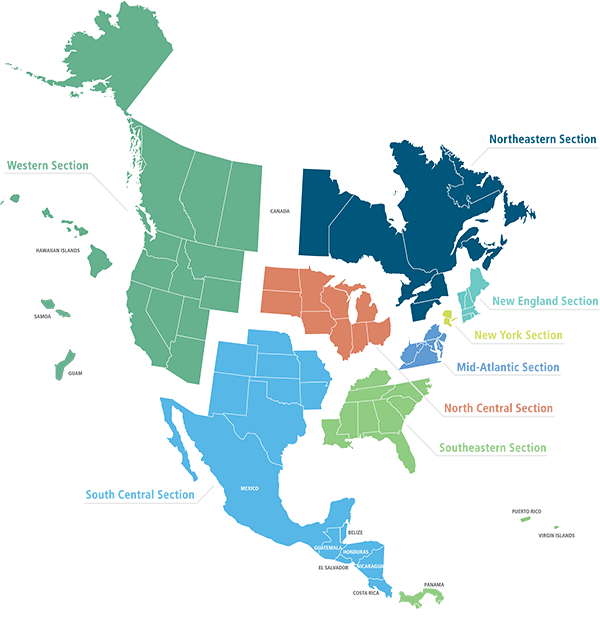 The AUA maintains a mandatory reciprocal membership requirement with members residing within the geographic boundaries of its Sections. This applies to all Active, Associate, Senior and Honorary (previously active) members. Section assignment is based on the boundaries found in the AUA Bylaws. Sections that share a common state determine membership boundaries by zip code. Members who move may retain membership in the original Section or join their new one. Demographic information about AUA members is available on the Member Profile [pdf]. Use the map below to view Section boundaries and contact information. Click on a Section from the map below to learn more. Each Section is chartered by the AUA as a separate corporate entity governed by its own board, association management company and section administrator. Members of AUA Sections are also integrated structurally into the governance of the national organization through positions on the AUA Board of Directors, and AUA Councils and Committees.